If you are among the many drivers of Indiana that want to want to find a wide selection of used cars for sale in Indiana at Fort Wayne car dealerships, then stop on over to Lucky 7 Car Stores. At Lucky 7 Car Stores, drivers just like you can easily find a wide range of used cars for sale in Indiana at Fort Wayne car dealerships. From cheap used cars for sale all the way to luxury used cars for sale, Lucky 7 Car Stores can easily help you get back out on the open road with a vehicle that you will love at our car lots in Fort Wayne, Indiana. Lucky 7 Car Stores has a knowledgeable staff is ready to answer any questions you have and steer you in the right direction when choosing your next car. So come and make a stop to Lucky 7 Car Stores car lots in Fort Wayne, Indiana today, and drive home with a used car for sale that you can be proud to drive around! 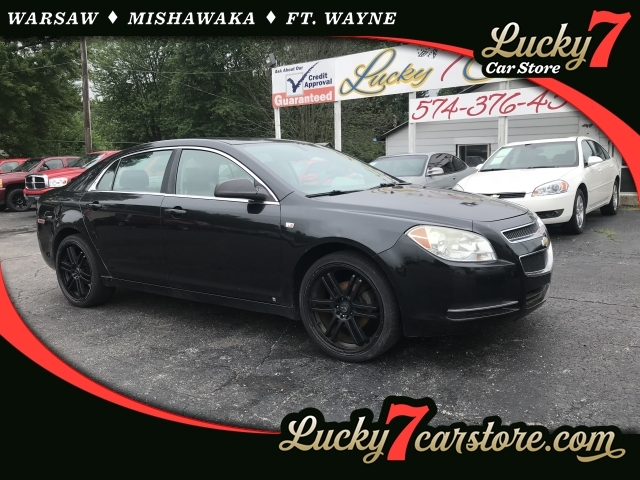 If you desire to get behind the wheel of a cheap car for sale in Indiana that can give you all of the options you desire at a price you can afford, check out the used cars for sale under $5000 near me at Lucky 7 Car Store. We have some of the best used cars to buy under $5000. Like the stylish Chevy Malibu for sale. Many would agree that Chevy is a great brand when looking for the best used cars to buy under $5000. And this Malibu is no different. With incredible gas mileage and a whole lot of great features and options, this used car for sale under $5000 is sure to be one of the best-used cars to buy under $5000 for many years to come. Some of the great features included on this used car are the auxiliary power outlet, cruise control, a satellite radio, and even more options waiting to be discovered by you. This used car near me is sure to give you plenty of reasons to think that this is one of the best-used cars to buy under $5000 from Lucky 7 Car Stores! So come on by Lucky 7 Car Stores today and check out this used Chevy car for sale under $5000 for yourself today! Lucky 7 Car Store Fort Wayne can be reached by calling 260-424-8866. You can stop in and see us at 2011 N. Clinton Street in Fort Wayne, IN 46805.